Food and cooking are no more confined in women's magazines or recipes books for single: their cultural and symbolic value added is now widely recognised. From cinema to literature, from television to dailies and reviews, anywhere food and cooking are a key topics. Most of all, food and cooking have now become a metaphor of life, the symbolic language through which any aspect of life can be seen. Who says that only rich cuisine is good? After a careful historical research Andrea Perin has collected 50 dishes taken from recipes books of the First World War. Each recipe is thoroughly commented and reveal the culture and tastes of the lower classes at the beginning of 20th century, showing how even cooking reflected the distance from the power. Between dishes and stories we discover the imaginative richness of a fancy gastronomy, invented with poor food, far from the pathetic mythology of "the genuine cuisine of the past". All 50 recipes were tested by the author himself and by his friends, so that the judgement on taste played a determining role in the choice for publication. 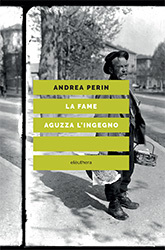 Andrea Perin is an architect and a museums curator based in Milan. He curates archaeology, art and anthropology exhibitions. As a hobby he studies food traditions, especially the ones of the past.